You Go Girl! : My Baylor Girls! 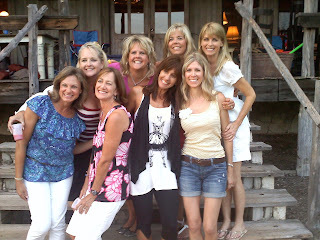 We have been getting together with my Baylor girlfriends since we all graduated from Baylor in 1985. Sometimes we have just girl trips and about 10 or so of us usually attend. 5 families of which none of the husbands went to Baylor-have been getting together at various places in TEXAS for the past 15 years. This year the 5 families gathered near Marble Falls, TX at the coolest house(s) ever. We just love it. This was our 2nd time to stay at MORIAH. This place is a Martha Stewart goes pioneer... so fun and decorated just amazing. Please google Moriah - Marble Falls to see this amazing place. Three other families joined us this year - we are so blessed to have the chance to spend time together.